A new study suggests there is a growing market in the illegal trade of guns and weapons in Libya via social media sites, in particular Facebook. The report covered 18 months and found sales of a wide range of items - from handguns to rocket-propelled grenades. Most were offered for sale on "closed" or "secret" Facebook groups. The illicit sale of guns is a violation of Facebook's terms of service, and a spokesperson said they encourage people to report any such postings. The report was commissioned by the Small Arms Survey, and used data collected by Armament Research Services (ARES) on a total of 1,346 sales. Researchers believe this is just a fraction of the full trade taking place on social media. The study will be released on Thursday, but BBC Newsnight has seen an advance copy. Col Gaddafi was an obsessive buyer of weapons and tightly controlled the market. During his 40 years in power, it is estimated he spent more than $30bn (£20bn) on arms. When rebel forces toppled his regime in 2011, the stockpiles were thrown open and a large black market emerged. Researchers believe the trade on social media began to take off in 2013, and is still growing. They looked at the trade of small arms and light weapons across sites, including Facebook, Instagram, WhatsApp and Telegram, and found the largest volume of sales on Facebook. The majority of weapons being traded were handguns or rifles. 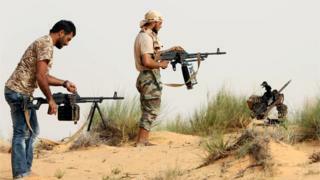 The most popular rifle was the Kalashnikov, which sells - they found - on average for 1,800 Libyan dinars ($1,300; £930). "While the bulk of the traded [items] were traditional small arms - handguns through to self-loading rifles and machine guns - there were also the more significant systems that could have battlefield impacts or terrorist use," says one of the report authors Nic Jenzen-Jones from ARES. "Manpads are shoulder-launched anti-aircraft systems. We found a number of complete systems listed, but also individual components... They're not really functional against modern fighter aircraft, but the great threat is to civilian aviation." Researchers found anti-aircraft systems cost up to 85,000 Libyan dinars ($62,000; £44,000). One offer was of an anti-aircraft gun which came complete with a truck. Most of the sales are concentrated in the big cities, principally Tripoli, Benghazi and Sabratha. The trade is a mixture of militia buying arms to fight, and militia disposing of them because they are no longer needed, they believe. Most of the sellers are in their 20s and 30s, with sales often completed via private messages or telephone. Weapons were mostly advertised for sale within "closed" or "secret" groups on Facebook - and therefore only viewable by members of those groups. The groups ranged in size from fewer than 400 members to almost 14,000. Some had very obvious names, such as The Libyan Firearms Market (now defunct), and many had been operating for the full 18 months of the study - suggesting, the authors say, that it is rare for such sites to be reported. In a statement, a Facebook spokesperson said: "It's against Facebook's Community Standards to coordinate private sales of firearms, and we remove any such content as soon as we become aware of it. We encourage people to use the reporting links found across our site so that our team of experts can review content swiftly." Researchers believe this is mostly an internal trade within Libya. However there have been concerns raised by the European police agency, Europol, over the number of weapons entering Europe from Libya.